A gardener who cultivates his own garden with his own hands, united in his own person the three different characters, of landlord, farmer, and labourer. His produce, therefore, should pay him the rent of the first, the profit of the second, and the wages of the third. It is not from the benevolence of the butcher, the brewer, or the baker, that we expect our dinner, but from their regard to their own self-interest. We address ourselves, not to their humanity but to their self-love, and never talk to them of our own neccessities but of their advantages. If a nation could not prosper without the enjoyment of perfect liberty and perfect justice, there is not in the world a nation which could ever have prospered. The uniform, constant and uninterrupted effort of every man to better his condition, the principle from which public and national, as well as private opulence is originally derived, is frequently powerful enough to maintain the natural progress of things toward improvement, in spite both of the extravagance of government, and of the greatest errors of administration. Like the unknown principle of animal life, it frequently restores health and vigour to the constitution, in spite, not only of the disease, but of the absurd prescriptions of the doctor. The statesman who would attempt to direct private people in what manner they ought to employ their capitals, would not only load himeslf with a most unnecessary attention, but assume an authority which could safely be trusted to no council and senate whatever, and which would nowhere be so dangerous as in the hands of a man who had folly and presumption enough to fancy himself fit to exercise it. Man has almost constant occasion for the help of his brethren, and it is in vain for him to expect it from their benevolence only. How selfish soever man may be supposed, there are evidently some principles in his nature, which interest him in the fortune of others, and render their happiness necessary to him, though he derives nothing from it, except the pleasure of seeing it. That the innocent, though they may have some connexion or dependency upon the guilty (which, perhaps, they themselves cannot help), should not, upon that account, suffer or be punished for the guilty, is one of the plainest and most obvious rules of justice. The difference between the most dissimilar characters, between a philosopher and a common street porter, for example, seems to arise not so much from nature, as from habit, custom, and education. Man was made for action, and to promote by the exertion of his faculties such changes in the external circumstances both of himself and others, as may seem most favourable to the happiness of all. Such is the delicacy of man alone, that no object is produced to his liking. He finds that in everything there is need for improvement. The whole industry of human life is employed not in procuring the supply of our three humble necessities, food, clothes and lodging, but in procuring the conveniences of it according to the nicety and delicacy of our tastes. Every individual...generally, indeed, neither intends to promote the public interest, nor knows how much he is promoting it. By preferring the support of domestic to that of foreign industry he intends only his own security; and by directing that industry in such a manner as its produce may be of the greatest value, he intends only his own gain, and he is in this, as in many other cases, led by an invisible hand to promote an end which was no part of his intention. Americans want action for their money. They are fascinated by its self-reproducing qualities if it's put to work. No complaint... is more common than that of a scarcity of money. 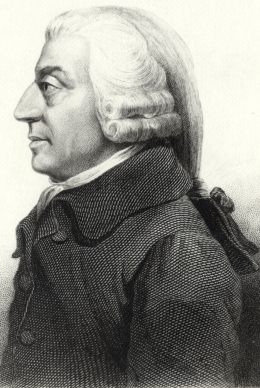 22 quotes by Adam Smith.